As I write this post we are enjoying some unseasonably warm weather here in the Great Lakes region of the Midwest. While the temperature has stayed pretty consistent in the 50’s to low 60’s this month, with chillier evenings, a warm front has moved in, bringing us temps today in mid-seventies. It’s gorgeous outside! However, by the end of the week the temperature is going to plummet, with only 42 degrees as the high and lows around 27 for Halloween. Brrrrrrrrrrrrr. Crazy as it sounds, I actually enjoy the first weeks of colder weather. There’s something so cozy about wrapping up in a fuzzy blanket, sipping on a nice warm beverage. I’ve been playing around with a few different recipes for delicious hot drinks, and this is one of my favorites. I’ve made it at least a half a dozen times in the last couple of weeks. It’s creamy, spicy, and best of all it has pumpkin in it! If you read my last post you know that I’m currently putting pumpkin in just about everything. 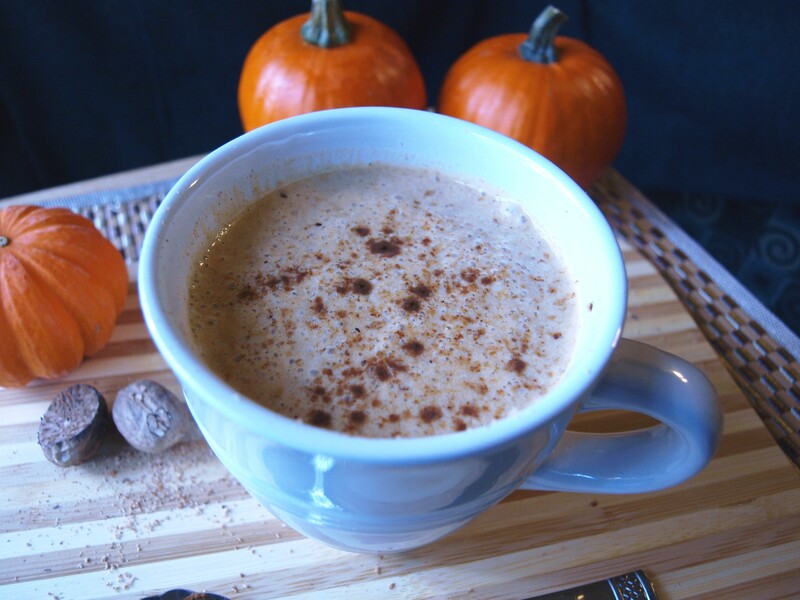 I originally set about creating a pumpkin chai tea latte, using black tea. I left out the tea one evening, since I didn’t want any caffeine before bed, and decided I liked it even better! Plus, without the caffeine, I’m able to enjoy the calming effects of the other ingredients. It’s a great alternative to the infamous (and unhealthy) PSL, and a perfect treat on a chilly evening. This innocent looking mug of steamed milk packs some powerful properties that will help you relax and de-stress after a hectic day. Almond Milk. Sipping on a warm milky drink in the evening can help you fall asleep easier. Not only does warm milk incite cozy memories of childhood, almond milk is a great source of calcium which can help you drift off by increasing the brain’s production of melatonin. Almonds are also a natural source of magnesium. Research has shown that even a slight deficiency in this mineral can make it difficult for your mind to settle down at night. A good night’s sleep not only benefits your mood and energy levels, but it improves your looks too. It is during the deepest stages of sleep that tissue repair occurs. Countless studies have shown how skimping on your nightly zzz’s can speed up skin aging and worsen acne. Caffeine-Free. Determining whether or not caffeine is good or bad for you can be a bit confusing. Some resources tout caffeine as a health-booster, with some studies correlating caffeine consumption with reduced risk for Parkinson’s Disease, Alzheimer’s, and even certain types of cancer. When it comes to feeling balanced and calm, however, that cup (or 4) of joe may not be your friend. If you’re hoping to reduce stress and anxiety in your life, you might want to consider reducing your caffeine consumption. Caffeine ups the release of catecholamines, or stress hormones, increasing cortisol and insulin. This reaction causes inflammation in your body, making you feel like “yuck” in the short-term, and possibly causing weight gain and mood swings (not to mention diabetes and heart disease) in the long-term. Caffeine can also effect serotonin levels, decreasing its synthesis in the brain. Low serotonin levels are associated with sleep disruptions, anxiety, depression, and decreased bowel functioning. Caffeine can send you on a mood roller-coaster, causing you to feel good when you’re up, and cranky when you come down. This leads to craving more coffee or soda for another boost, which leads to poor sleep patterns, health problems, and increased stress. Not exactly a recipe for looking and feeling your best. The majority of experts agree on limiting your daily consumption of caffeine, and eliminating any source of caffeine after 2 p.m. to prevent sleep disruptions. In addition to helping you relax, unwind, and get some beauty sleep, this drink just plain tastes delicious. 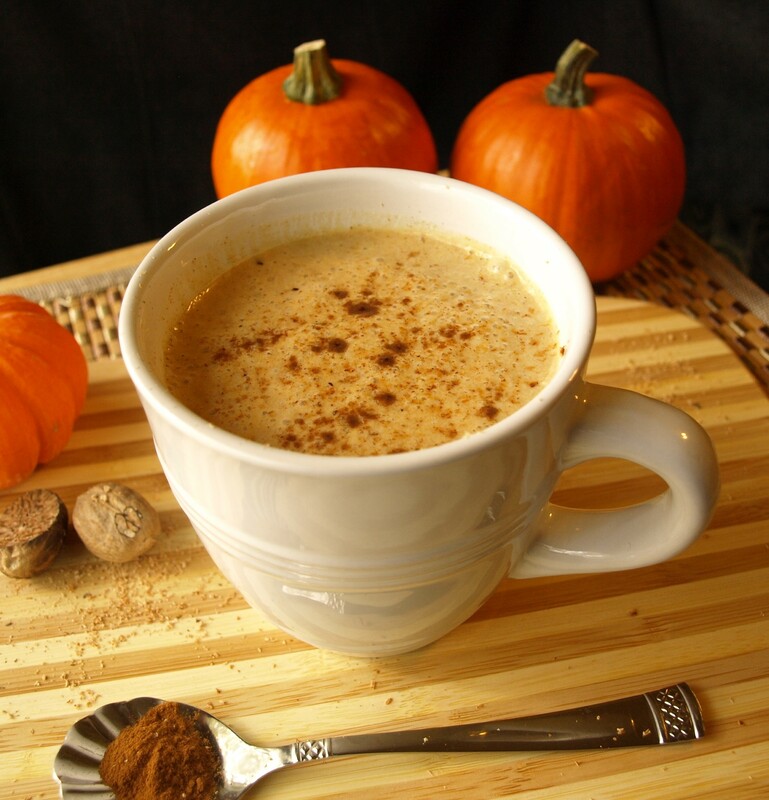 With the addition of cardamom, ginger, cinnamon, and vanilla, this is reminiscent of a chai latte, with some pumpkin thrown in for good measure. I hope you enjoy it as much as I do. Whisk together all ingredients except vanilla in a small saucepan over low heat. Heat gently just until milk starts to steam. Remove from heat and stir in the vanilla extract and sweeten to taste with pure maple syrup or preferred sweetener (I usually use about a teaspoon of maple syrup). Pour into a mug and sprinkle with extra cinnamon and freshly ground nutmeg. Breathe it in (mmmmm), and enjoy! Adjust spices to taste. If you love cinnamon, toss some more in. This is your mug, make it your own! Top with homemade coconut whipped topping for a decadent treat. Just refrigerate a can of full-fat coconut milk the day before, then open the can and scoop out the thick cream into a small glass bowl. Whip the cream with a fork and add in a little sweetener if desired. You can adjust the amount of pumpkin to your liking as well, but be warned, there is a fine line between pumpkin flavored steamed milk and pumpkin soup! I found this out firsthand once when I added too much pumpkin and my “drink” was thick enough to eat with a spoon. Still delicious, just not exactly what I was going for. P.S. What is your favorite way to relax and unwind after a stressful day?